I’d flip flop Realmuto and Herrera, at least for now with Herrera having such a good game yesterday. I’fd also keep Hernandez and Franco where they are, since Hernandez has a higher OBP and Franco more power. Although it's not real significant in lineup simulations, it's better to have OBP in the 8 hole than power. Phillies end spring training on a high note as Malvin Matos hits a ball to right for an opposite field walk off home run in the bottom of the 9th to give the Phillies a 3-2 win. Phillies first two runs on a second inning homer from Franco. Arrieta pitches six giving up a two run homer in the second. He gave up 6 hits, no walks, and K's 8. Scoreless innings from Neshek, Alvarez, and Dominguez for a good day from the bullpen. 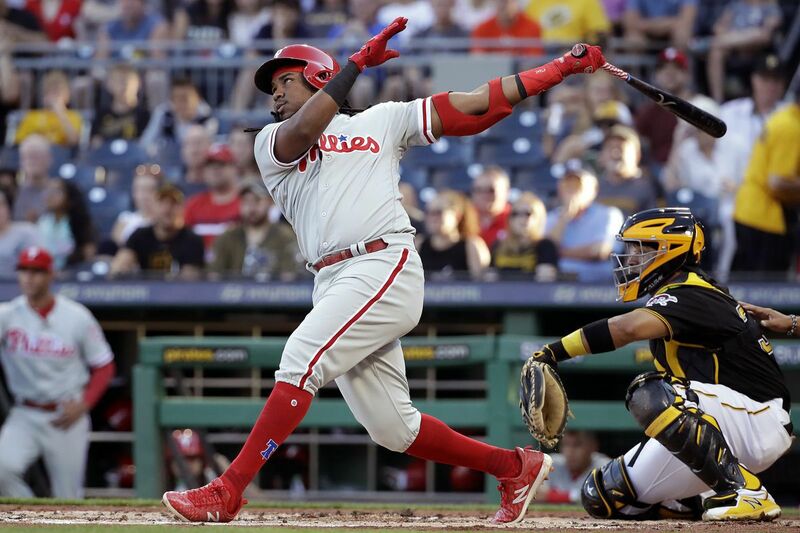 Seranthony gets the W.
I don't like hitting Franco 8th--it will exacerbate his tendency to chase bad pitches since pitchers won't worry about the pitcher being on deck. Flip him with Hernandez. Didn't Franco improve last year when batting 8th? ISTR Kapler doing it intentionally to improve Franco's selectivity or something like that, and explicitly saying in the media that Franco being 8th in the order wasn't a punishment but an attempt to get him to approach his ABs differently. I thought it was pretty smart (esp. since it seemed to work), but what do I know. Yup you are remembering that correctly, though it didn't happen that often. Franco entered Tuesday with nine hits in his first 21 at-bats from the eighth spot. Only three starts and 12 games at the other five spots in the order. These lineup discussions sure are more interesting than at the beginning of last year. Lots of interesting possibilities with L-R, speed, OPS and power. Let the games begin! Improves with each lower level. Bat him 9th and he is a sure Hall of Famer. But seriously, let's see how he does with a couple weeks in the 8 hole to start the season. Smile noted, but FWIW: Only 7 PAs, a .452 OPS and a BA that matched his SLG (i.e. he had one single). Fangraphs finishes up with the Phillies 4th in bullpen rankings (which means just say no to Kimbrel). RF was 4th also with Harper. Starting pitching was slightly above average at 12th. There is a drop down in the article to show all the Phillies rankings on one page. As positional power rankings wrap up, we present the best of the bullpen best. The team's current weak areas are 3B (28th), CF (21st), and 2B (17th). Keep that in mind when thinking about ways to improve the team mid-season if the need arises. The biggest bang for the buck would be a 3B upgrade and even the most favorable Kingery projection would not move the needle that much. One other tidbit I noticed in the RF rankings. Phillies (Harper) are 4th behind the Red Sox (Betts), Yankees (Judge), and Brewers (Yelich). The difference in the rankings is all defense. Harper actually has the best offensive projection of those 4 players. If Harper's defense were neutral he probably would have the number one ranking here. Interesting that they put the Phillies 12th in starters. There doesn't appear to be much of a margin between the Dodgers in 7th and Rockies in 13th though. Given that they seem relatively low on Nola (4.2), Arrieta (1.8) and Pivetta (2.3), I think there is a lot of room for improvement come end of season. Remember these are projections. Nola at 4 WAR is still a really good year and the history of young pitchers with his stuff is not as good as the 10 WAR he had last year. The reason that we are above average is that 2-5 we are all solid but not special. 4 pitchers in the 1.5-2.3 WAR range. The key thing is they expect us to have 7-8 WAR from our starters. In reality with young pitchers it might be that one steps forward with a 4 WAR year and one steps backward with a negative WAR year. I think starting pitching is probably the second area beyond 3B where we might seek to improve. Kingery and Quinn give us some internal options at 2B or CF if things went poorly for the starters. But out of 5 starting pitchers, it is likely that 1 or 2 will have bad years and I am not sold on the team relying on anyone from the AAA rotation. De Los Santos and Eickhoff and Anderson really look like nice 5th starter types. They are not the pitchers you would have confidence in if you want a 2-win upgrade for the playoffs. I think the low projections for 2B and CF are also a potential cause for optimism. Their track records are better than that and they are not necessarily declining, if those were off-years in 2018. Remember these are projections. Nola at 4 WAR is still a really good year and the history of young pitchers with his stuff is not as good as the 10 WAR he had last year. In addition, Nola had 5.4 WAR by Fangraphs accounting, not the 10+ WAR that Baseball-Reference credited him with. Yes. Fangraphs uses the component numbers so its projections will be closer to FIP each time. BR uses performance more so I guess if one thought Nola would have a consistently low BABIP and high swing/miss rate then 4 WAR could easily underestimate him. All these are regression to the mean though. So players with a good year are expected to get worse (like Nola) and players with a bad year but solid history might be projected to improve. Pivetta and Velasquez look good in these projections simply because they miss lots of bats and stuff>luck when you project. The upside on Velasquez is worth spending lots of time to try to find. I saw him a couple of times in Spring Training and the stuff was great but the location is poor. He is not as good as Max Scherzer, but there are some similarities in terms of stuff. Scherzer did not become great until he was 27. Jacob de Grom did not even make the majors till he was 26. Velasquez turns 27 in June. Clearly he has a shorter leash this season than in the past, but he is really important to the team. His lack of success would most likely lead to a trade (rather than seeing if the AAA guys were any good). I woudl ignore Nolas 10 Baseball Reference WAR. At this point I'm confident that was massively inflated by poor Phillies defence in non Nola starts. I still expect more than 4 fWAR for him though, and even if they get that one right I think its likely we see better seasons than they are projecting for at least one of Pivetta and Arrietta. I'm with Zambonir on 2B and CF. I'm quietly optimistic in a rebound year for Odúbel. I'm more optimistic in a rebound year for Hernández. It seems likely that his poor year was tied to the foot injury he was carrying for a large portion of the year. I don't expect either to be all stars, but 3 win seasons don't seem out of the realm of possibility and we know Herrera has the potential to put up closer to 4 wins, hes done it before. I woudl ignore Nolas 10 Baseball Reference WAR. At this point I'm confident that was massively inflated by poor Phillies defence in non Nola starts. You're gonna have explain the math on that one to me. The statcast guys did a podcast on it. Basically the Phillies defense was very bad in 2018, but it wasn't equally bad for all of our starters. Nola was effected much less than Pivetta for example. Bref don't look into every game, they look at the defense on a whole and credit the pitcher for playing in front of a poor defense. As we mentioned above, we can't completely give blame or credit to the defense for good or poor BABIP numbers, because that ignores what kind of contact the pitcher is giving up in the first place, and among qualified pitchers, Arrieta, Nola, and Pivetta all finished in the Top 15 in ground-ball rate. In order to account for that, we can look at Expected Batting Average, a Statcast™ metric that looks at the exit velocity and launch angle for each batted ball and describes how often similar batted balls turn into hits. 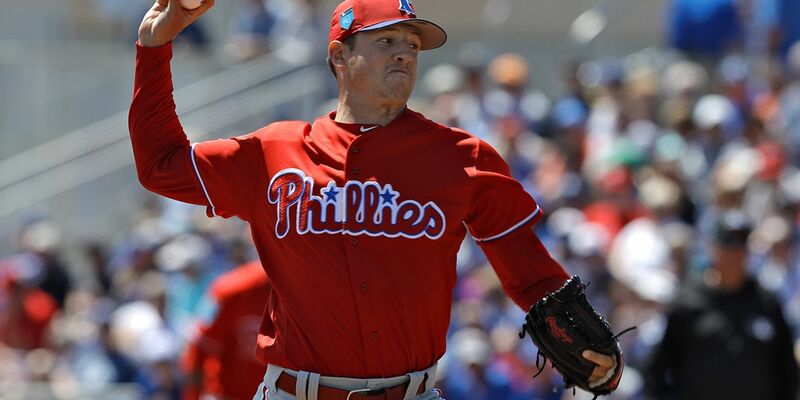 If we look at it on ground balls only, we can see how our five regular Phillies starters did. As expected, Pivetta, Eflin, and Velasquez saw real-world outcomes worse than the quality of contact they allowed would indicate. But surprisingly, Nola and Arrieta each collected more outs than their already-strong quality of contact would have suggested. "Being good and having favorable outcomes on top of that" is a good way to get to those low BABIP numbers we shared above. I think the real difference in the formula is not really making any huge judgements about the Phillies defense. It is essentially assuming the quality of contact is random in the Fangraphs formula. 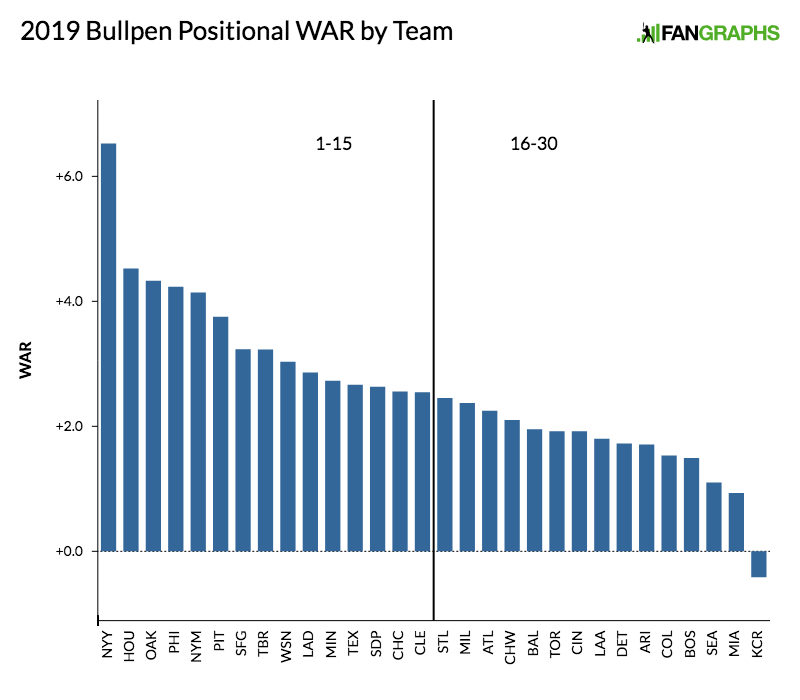 Fangraphs uses something closer to FIP as the base of their projections (assuming BABIP is pretty random) while BR uses the actual stats (where Nola's lower ERA and high K rate drive the WAR formula). Fangraphs is probably better at projections, but BR is measuring how good the results were. If Nola repeats his performance his projections will start assuming his BABIP will be lower than average. Right now the projections think that is mostly luck. I think there's a good possibility that Arrieta will bounce back to some extent, and Pivetta and Eflin take a step up. Velasquez is more iffy, at some point if you don't develop command and consistency you never well - I could see him packaged in a trade this summer if he struggles, always someone who'll take a chance on pure stuff. Hernandez (foot) and Herrera (attitude) are good bets to bounce back. Franco may be what you see is what you get, and 3B the most likely area of upgrade. As far as SP, my suspicion is unless a Verlander type deal is available, they'll go with the kids in Lehigh, they'll give Velasquez a couple months (8-9 starts) to see if he can pull it together and then promote the best looking SP at Lehigh for the 5th spot. No point trading for a meh vet when you have kids who might pull a "Bystrom or Happ." What the Oswalt trade should have taught is you don't overpay for a 4th/5th starter if you have a solid trio. The FIP vs. RA9 difference accounts for a bit less than half of the Fangraphs vs. B-R discrepancy. The rest of the difference is presumably the team defense adjustment. Both UZR and DRS had the Phils as terrible defensively last season, but the magnitude was significantly different, -45.6 UZR vs. -136 DRS.